Levels feel like full levels again! This is probably the hardest game in the lineup. In fact, it may even be too hard in some ways. Enemies are very aggressive and relentless, they are very fast and swift at attacking, and they are very good at tracking your movement during an attack. 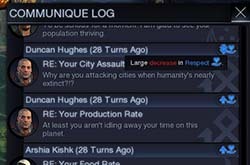 I feel like the game is sadly front-loaded with excessive difficulty. Oh, don't get me wrong! 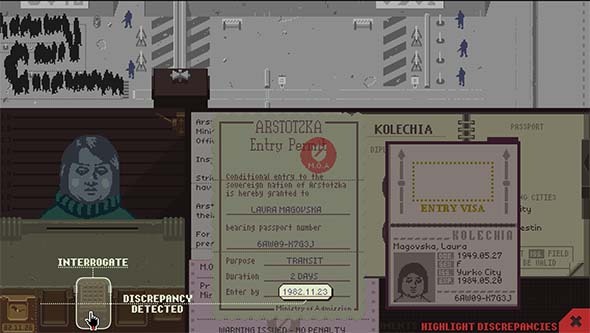 It's hard throughout, and there's still some definite mid-and-late-game peaks of difficulty. But this game easily has the highest barrier to entry of any game in the lineup. Dark Souls III is very hard and very much front-loaded with difficulty. 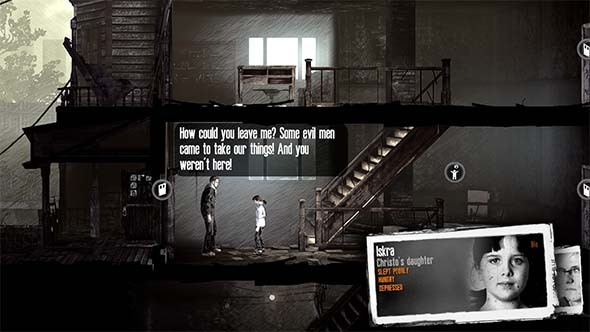 It's one thing to provide a challenge, but the early levels of this game maybe cross the line into outright cruelty. If I weren't already invested in the series, I might not have even made it past the Lothric knights in the High Wall. Yeah sure, Demon's Souls had the Red Eye Knights, and Dark Souls had the Black Knights, and Bloodborne had the warewolves; but in those cases, those difficult enemies were blocking optional paths and items. This is why I can kind of tolerate the mutating tentacle monster on the rooftop that hits very hard, has a ton of HP, obscures half the screen, and causes an annoying framerate drop. Yeah, it's located in a critical path of the level, but it can be easily avoided and is basically just guarding a crystal lizard. 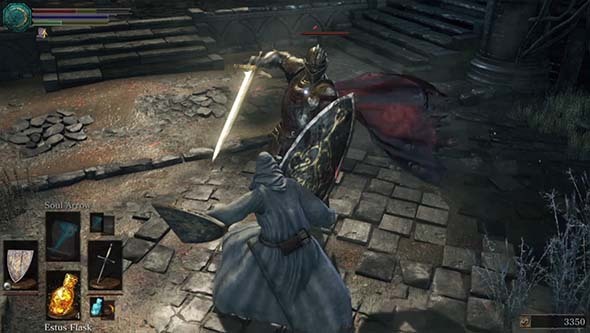 The difficult Lothric knights, on the other hand, are placed in critical bottlenecks that must be passed as part of the necessary path of progression through the level, and they will shred new players to pieces! Heck, even that fat, winged knight going around in circles in the courtyard is easier than the Lothric Knights. And then you get to the Undead Settlement, which is a maze full of ambushes and difficult enemies. Those fat evangelists and the large cleaver undead hit hard and have deceptively long reach and multi-hit combos. This is at a time when your HP and stamina are so low that you can't reliably block their attacks. Their long reach and relentless aggression means you can't back away either. So you're stuck having to stick to close range and roll through their attacks - a maneuver that can result in a quick death if you make but a single slip-up. I had a lot of trouble handling these enemies (as I was still getting used to the new timings for dodging and parrying, and the stamina requirements for blocking), and so I imagine that many rookies will likely be completely overwhelmed. Dangerous enemies have narrow windows for parrying their attacks, making it hard to practice this technique. There's a higher skill floor than in previous titles, and the game demands a further degree of mastery of rolling, stamina management, i-frames, and weapon movesets that previous games simply didn't require. Bloodborne also toes with this line, but Dark Souls III seems to go a bit further. The problem here is that enemies become far too fast and deadly far too early in the game, and the player character remains slow and relatively weak. What's worse is that the game breaks with the original's insistence on fair difficulty by apparently completely failing to enforce the rules regarding stamina for enemies! This was also a problem in Dark Souls II, but it didn't bother me quite as much because those enemies had slower attacks that were generally easier to dodge. 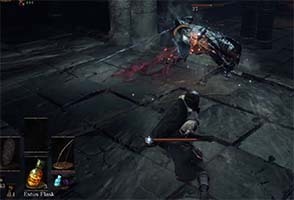 There's no gradual ramping up of challenge for the player to learn things like roll and parry timings, and there aren't any large, slow enemies to practice these techniques against. Bloodborne had very fast enemies to go with its very fast combat, but the character was also equally fast. 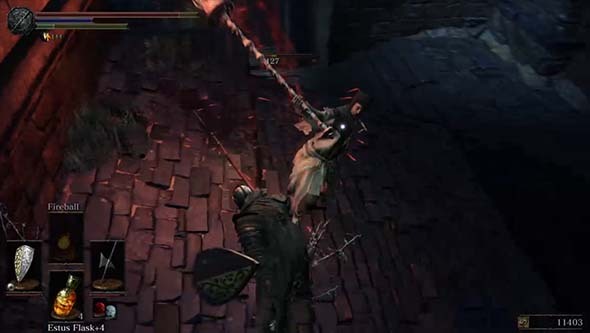 Bloodborne also had the Brick Trolls, whose telegraphed attacks gave plenty of opportunity to practice parrying in the very first level while still making progress. Dark Souls III simply doesn't have this. There's the undead spearmen that are easy to parry, but they're so slow and defensive that you'll likely just get bored waiting for them to attack and miss your opportunity to parry. Sure you could go back to the tutorial level to practice parrying, but then you're not making any progress. There's also a lot more instances early of mobs, including the presence of difficult casters (or even bosses) being among those mobs. Fortunately, the boss is very slow and lumbering, and the casters have good audio cues for when they're casting that help to make these mobs less frustrating to deal with. Poise has been disabled for players, which means enemies will always stagger you, but you might not stagger them. Perhaps the biggest contributor to the game's difficulty early on is the completely baffling way in which poise and defense work - which is that they don't. In addition to not being able to upgrade armor to improve its defenses, the poise stat appears to have been completely disabled for all players in the game's code for ... some reason. 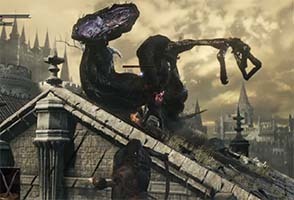 Poise was one of the best additions from Dark Souls 1, and its apparent removal completely baffles me. Is it bugged and they're planning on fixing and enabling it later via a patch? Is it planned to be part of DLC? "Hey, want poise back? Pay $15 for this DLC!" The value still shows up in the UI, and there's still rings and weapons that exclusively improve poise, so it definitely seems like FROM intends for poise to be in the game. The enemies seem to still have poise, so this situation seems completely unfair. This might be part of the reason why the start of the game feels so difficult, since those damned speedy Lothric Knights can hit through your attacks, but you can't hit through theirs!